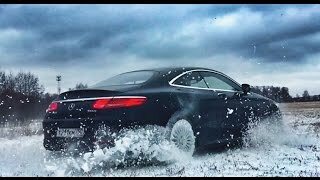 Point of view test drive video of Mercedes-Benz S-Class 500 Coupé 4Matic year 2014. The S 500 Coupé has a V8 (8 cylinders) 4663cc petrol engine and delivers 456 BHP and a whopping 700 Nm of torque. The S500 goes from 0-100km/h in 4,6 sec and top speed is limited at 250km/h. The S 500 is equipped with a seven speed 7G-TRONIC PLUS automatic gear box. Retail price of test car: 167.750 €. Starting price of S 500 4Matic: 130.922 €. POV rijtest van de Mercedes-Benz S 500 Coupé 4 Matic van 2014. De S 500 Coupé heeft een V8 benzinemotor van 4663 cc en levert 456 pk en heeft een koppel van 700Nm. 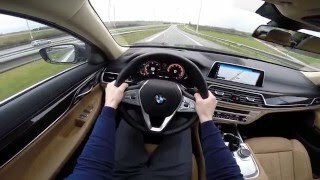 De S 500 Coupé gaat van 0-100km/u in 4,6 sec en de topsnelheid is begrensd op 250km/u. De wagen heeft een 7G-TRONIC PLUS automatische transmissie met 7 versnellingen. 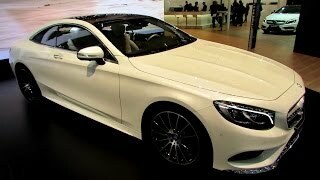 Is this 2015 model or did 2014 s550 coupe had 4matic? That is so quiet! 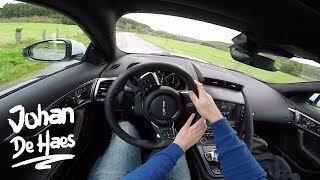 You hear none of the outside or tarmac noise but you can clearly hear the V8 music. How did they do that? In the rain? REally? Repost when it's dry. are comfort and suspension same as s class limo ? Amaaaaazing car. Great POV. Good Video. Does the S500 feature the ambient lighting? this is nice car ! top luxury limusine !!! It seems to be fairly quick and it has a really nice exhaust note? Who Needs an S63 AMG when you can have this one? yes it sounds better than a stock S63 coupe. does it have active magic body control? In the description you say "the S 500 is equipped with a seven speed 7G-TRONIC PLUS automatic gear box." I believe that's wrong. The car is equipped with a nine-speed 9G-TRONIC transmission gearbox. 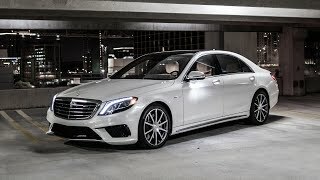 +Don Draper i'm pretty sure the S500 4Matic in the video has a 7G-TRONIC PLUS gear box. I have a fact sheet of the test car and it says 7G-TRONIC PLUS. It also says so in a press release of 2014: "The 4MATIC version of the new S-Class Coupé features the 7G-TRONIC PLUS automatic transmission with DIRECT SELECT lever. "..and "The new 9G-TRONIC nine-speed automatic torque converter transmission is used in the rear-wheel-drive variants of the S-Class Coupé" http://media.daimler.com/dcmedia/0-921-1721304-1-1709964-1-0-0-1710107-0-1-11702-1549054-0-1-0-0-0-0-0.html?TS=1460198347692 However on http://www.mercedes-benz.de it says now that the S500 4Matic has 9G-TRONIC gearbox so i assume they replaced between now and 2014. What parents what was done this test drive, very beautiful place, matching the car. excellent video. +Ronaldo Miguel Ferreira ola Ronaldo, thanks :) Glad you like the video.